“Life” – What is it and how will you define it? Well, it is not as easy as you think because no one till date have understood how life came into being and what it is made of however we can comprehend that anything that is alive, moves, eats, breathes, uses energy, grows, reproduces, responds to the environment and gets rid of waste. In today’s modern, quick paced environment, the actual purpose of life is lost and the focus of life has shifted from achieving significance to mere existence. We are engrossed in day-to-day tasks and head either towards power, money, fame, success and other material possessions. In this process we have forgotten that it is a gift by the creator that binds everyone with the universe and has to be utilized in a proper way before it is taken away. The physical body houses the mind and the soul of a person and goes through various changes starting from birth till death. It is with the help of the body we see, hear, feel, move, taste and smell. In short, our body enables us to enjoy all the wonderful aspects of nature and our surroundings. Though we are able to notice the outward changes happening in our body, most of the time we become unaware of the changes happening inside the Prana-deha that offers the essential, life sustaining energies for doing physical and mental activities. In other words, you can call a human body an amazing unit that is pre-programmed with complex mechanisms that is not planned by us but by some unknown force. If we try to understand, we can notice that our body is closely related to the natural elements around us. A further insight might even reveal that our body possesses the traits of air, water, fire, ether and earth and even functions in the similar fashion. Very few have realized the similarities between breathing and air, body temperature and fire, blood flow and water, reproduction and earth, vacuum and ether because we tend to get carried away by mundane tasks and fail to recognize the need to tend to our bodies bestowed by the almighty. As a resultant, disturbances can occur in the functioning of the vital energies and can lead not only towards health related issues but also mental health. No wonder our enlightened ancestors treated our bodies like holy shrines and emphasized on holistic well-being. They knew very well that only a healthy body can nurture a healthy mind and soul and help them reach higher, spiritual goals. According to our ancient scriptures of Ayurveda, a body can be classified into three major types that are either dominated by Vata, pitta or kapha. This is why Ayurveda treats each and every individual as a unique entity who requires specific approach than a generic approach. Having known the very many benefits of Ayurveda and other various age-old, widely accepted methods like Yoga and Mudras, Jeevanacharya with his profound knowledge prescribes the right advice to individuals and help them achieve optimum health. You might wonder why yoga is considered as the best practice when there are so many exercise forms available. Patanjali – the yogic guru describes yogasanas as “Sthiram Sukham Asanam”, that literally means “asanas provide stability and joy”. Jeevanacharya hails this form of physical practice not only for this reason but also due to the fact that it could be performed by all irrespective of age, fitness and gender. Unlike other exercise forms that concentrate on mere twists, stretches, turns and body building, yoga improves flexibility and body strength through postures while enhances focus and self-confidence through breathing. It also unfolds the infinite potentials of the soul and mind whereby achieving inner peace and realization of the self. Mudras otherwise known as gestures may involve the body as a whole or can be performed using simple hand positions. It revolves around the concept that our fingers have the traits of the nature’s five elements viz., air, water, fire, earth and ether. Though this principle is simple to perform, it has proven itself from time and again as one of the highly effective practices that can be done anywhere and everywhere. When combined with yogic breathing techniques, mudras improve the flow of prana in the body and in turn energize the body parts. Soul can be described as an essence of life, because of which we are alive. In simple words, a body gets its identity, personality, will, emotions, desire, intelligence, speech, thought, hearing, sight and movement only with the help of a soul, without a soul a body is a mere lifeless exterior. Irrespective of all beliefs and religions, everyone accepts the views on rebirth or reincarnation. It means only the body that is similar to a container or capsule deteriorates and dies whereas the soul does not die but moves on to take another form or body to fulfill its desires or objectives. Actually the true nature of the soul is immortal, pure, free, illumined, non-dual and possesses all the virtues of the universe. It is free of hunger, thirst, pleasure, pain,evil, good, death and birth. But an embodied soul gets linked with the mind and hence with the organs of action and perception that are all subordinate to the mind. Since the body is influenced by the mind that creates desires, doubts, faiths, decisions, consciousness, patience, fear, intelligence and various other emotional attributes, the soul too acquires some of those impressions or imprints experienced during a lifetime and hence when it acquires another body some of them are revealed as traits. Hope this provides an explanation how geniuses, prodigies, spiritual gurus or talented businessmen are born and have acquired their intellect and unique characteristics from previous births. Blessings of a guru are of great importance. It is similar to consulting a doctor, lawyer, teacher and the likes for issues concerning of that particular relevance. Since a guru has a selfless attitude, cultured body, mind and soul with elevated levels of wisdom, he would be right person to provide us insights on our sufferings regardless of its nature. Our jeevanacharya is such a personality who is simple to approach and converse with ease. He brims with love, care and empathy for his fellow beings that a mere sight of him can heal souls; such is his charisma and divinity, needless to mention his blessings. We all know that brain exists inside our body and functions as a central processing unit carrying out all tasks that is required to keep us alive. If that is so what is mind, who controls it and what is its role? For long, this question has been reverberating among all those who have started their journey towards self-realization and also among those who are focused to achieve higher goals in their lives. Such people normally claim that they are focusing or finding ways to tame their minds and not their brains. Well, that is why Jeevanacharya propagates towards a sound mind. According to him mind is where emotions, consciousness, and memories, judgmental and thinking abilities are created and are unique to each and every person while brain is considered as a physical entity inside our body that is controlled by the mind. Now you can understand why each individual behaves differently even if exposed to the same kind of a situation. You can also relate brain to a vessel containing a substance called mind. To take good decisions both the brain and mind need to be pure and healthy, even if anyone of the two entities becomes unhealthy or corrupted the whole objective to excel in life would be lost. Now that we know how important to possess a cultured mind, let us try to understand it in the perspective of athma yogis like jeevanacharya. According to them mind does not have a form, colour or any other identity of its own. It behaves like a chameleon and feeds on situations and behaviours. It is said to wander wildly creating thoughts and views based on the physical senses. Hence yogis and saints emphasize on culturing or controlling the mind. For better understanding you can compare a mind with cultivating land that has great potential to grow high yielding crops but for which you need to tilt the soil, prepare it before hand sowing and after sowing should free the land of weeds. The same way mind has to be freed from unwanted and unhealthy thoughts produced by sights, hearing, feelings and smells which is also said to be the major cause of miseries in humans. Mind can also be compared to a spoilt child who is pampered by its parents (self). 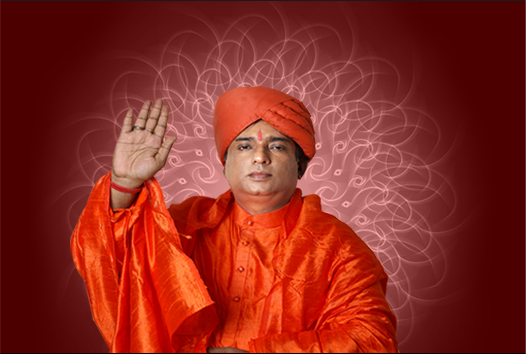 This is where the role of guru who has understands the subtle, secretive ways of the mind is considered of utmost importance. Because he is the one who can take us through the psychic processes of conviction, logic, awareness and trust so as to help us control our mind. Jeevanacharya having mastered the mind controlling techniques, offers meditation and pranayama as remedial measures to all those who come to him in the quest for knowledge about the psyche or mind and also to those who suffer from various doshas, physical or mental sufferings. The word “Prana” means life force which involves breathing and “Pranayama” means breathing technique. It is a known fact that no one can survive without breathing as it is the only mechanism to distribute “oxygen” throughout the body. Everyone can stay alive without eating food even for months and live without water for few days but it is impossible to stay alive without breathing even for a few minutes; it is that important. The amazing benefits of the right breathing technique not only leads you towards physical wellbeing but also mental wellbeing and is hailed as a proven self-healing technique by all. Studies have proved that breathing pattern changes according to your actions and thoughts and hence when you are happy your breathing would be rhythmic while unhappiness or stress can cause an irregular or interrupted breathing pattern. In recent years, divorce rates are on a steep increase irrespective of caste, creed and country. Once prevalent only in the west, divorce is now prevalent in all parts of the globe. A large number of marriages are either engulfed in crises or on the brink of collapse because the actual essence has been either forgotten or diluted over the passage of time. Wedlock or marriage can be viewed in different ways depending on the individual ideologies. Marriage is not the same as it was considered once as ‘bliss’. Some consider it as a mere convenience of staying together providing emotional and financial security while some consider it as destiny’s choice and go with the flow of life irrespective of whether they enjoy the company of each other or not. There are also some who view it as a means to fill the void in their lives and hence can even end up marrying again and again, though not the same person as a means of replacement. So what makes marriages go sour? Actually there are many factors that are believed to have an impact on the harmony of marriage. Few of the main reasons are given below. All marriages do not suffer the same fate as there are many successful marriages with strong and trustful relationships that have managed to sail through various difficulties, challenges and tests of time. Superficially it might seem as if it is because of compatible and loyal couples, but if deeply pondered it could point towards their zodiac sign, five boodhs or birth chart compatibilities because humans and their characteristics are highly influenced by cosmic energies and ‘karma’ or past life instances. 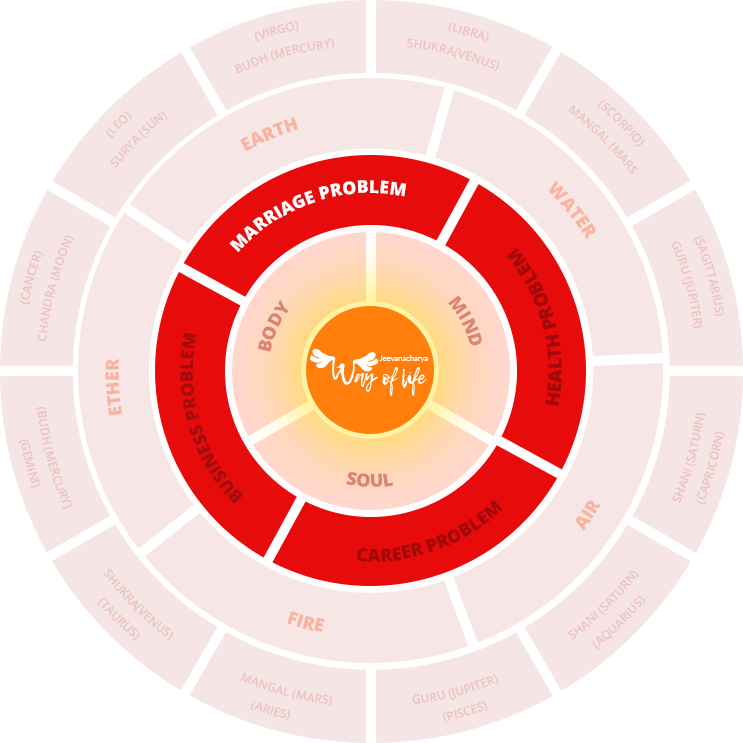 Since jeevancharya deeply understands the relationships between benevolent and malevolent planets, birth chart positions and their effects on humans, he is able to show the right path and give idealistic solutions to couples. This way he has helped many to understand the sanctity of marriage and have made them realize marital bliss. Health and the science of astrology go hand-in-hand from times unknown to mankind. Though there are various means and measures by which the health of a person is being evaluated and treated by modern science today, still there are many health issues exists and goes unanswered. Wonder how our ancestors stayed healthy and thwarted the incidence of diseases or illnesses? Well, they had the time proven technique of associating human body parts with elements of the universe and had assigned zodiac signs that ruled the body parts for easy understanding and treatment. According to them brain, face and head belonged to the zodiac sign Aries, neck, throat and voice to Taurus, arms, lungs, nervous system and shoulders to Gemini, stomach and breasts to Cancer and chest, spine and heart to Leo. The same way digestive system belonged to Virgo, kidneys, moles and skin to Libra, excretory system and genital organs to Scorpio, thighs, hips and liver to Sagittarius, skeletal system, joints and knees to Capricorn, circulatory system and ankles to Aquarius, feet, lymphatic system and toes to Pisces. Similar to the link between the zodiac signs and body, the birth chart too with the planetary positions can help determine an individual’s health condition and the diseases he or she can get affected to. The first position or house is linked to the physical body in general, second house to the food preferences, blood and diabetes incidence, third house to speech related issues like lisp and muteness and lungs (such as bronchitis or asthma). The fourth house of the birth chart is linked to genetically related problems and pregnancy while the fifth house is linked to heart related ailments. The sixth house denotes diseases in general, seventh house is linked with nervous system and problems associated with it including spine or brain related health issues. The eighth house denotes health issues due to karma, specific to any gender or by others. Nineth house of the birth chart can provide insights on brain’s cerebral hemisphere while the tenth house is linked to body metabolism. The eleventh and twelfth house is linked to circulatory system and hospitilzation caused by isolation or depression respectively. 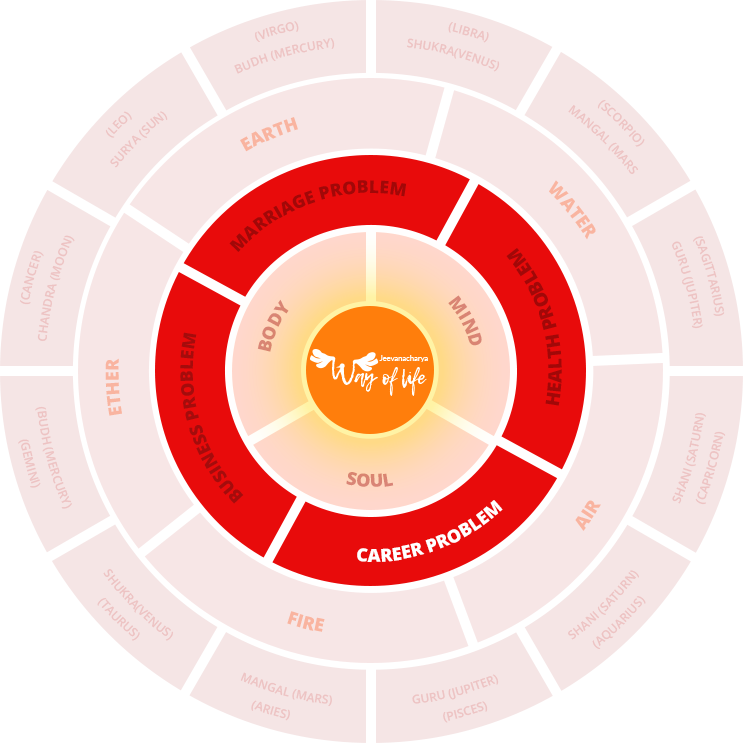 Other than the above said method health related problems can be studied and found out by the influences of five booths specific to zodiac signs while the mind and soul related problems can be found out only with the help of the guru like jeevanacharya who has been living an ascetic life for more than a decade. Many have sought his blessings and advice for he has made his life a mission to see humans getting liberated from all kinds of miseries including the ones related to health. Career aspirations are different for different people for certain people it might lie on a prestigious title while for another it could be the amount of money they would like to earn as a salary and perks. A successful career depends on various factors such as the inter-relationship with the sub-ordinates, boss, departments, clients and collegeaus based on personal values, characteristics, attitude, wisdom and skill of the self and also of the persons we are dealing with. 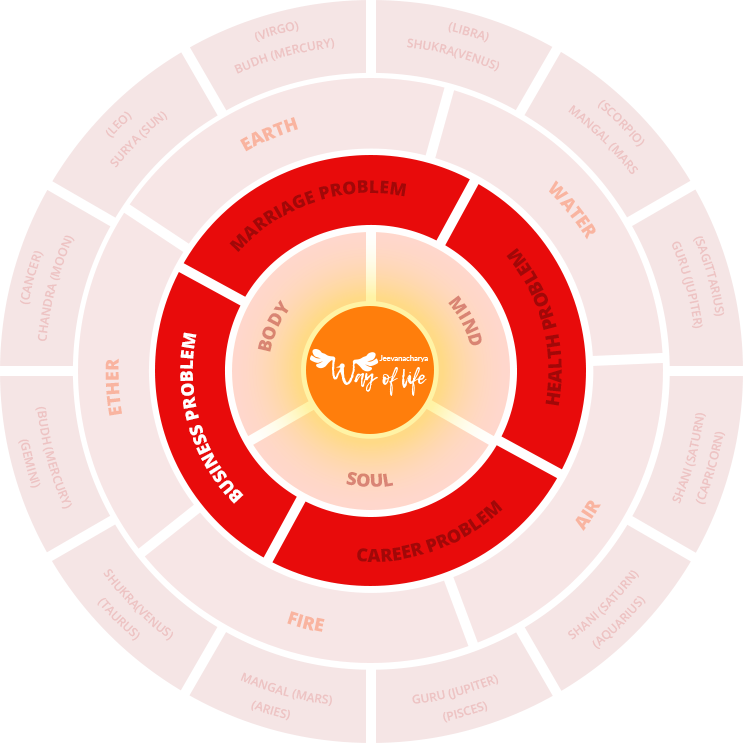 Each and every individual is born with unique characteristics depending on the planetary positions during his or her birth and hence a well-read birth chart can be quite vociferous not only what career would be suitable but also can indicate upcoming opportunities and favourable timings to coordinate efforts whereby increasing chances to acquire desired results. In general Jupiter is considered as a chief planet providing or creating opportunities and depending on its natal position results can vary. If someone has Jupiter in the 12th house or position of the natal chart, one could get opportunities from the unknown. When this fact is known it could be used for cultivating new contacts for creating opportunities. The same way the planet ‘venus’ is considered to bring luck, when it is in the favourable position it could bring reputation to the individual especially in public domain and provide career opportunities in customer relations or public service sector. Above all, Karma or past life actions too can be major contributor but that might not be visible to read or inferred from a natal or birth chart. Only a pure soul like our jeevanacharya can get to the deepest level (soul) of the individual and provide ideal solutions using which one can know the career that would suit him the best and the right time to pursue his ambitions to reach the top level of the career ladder. The ultimate aim of business start-ups and running businesses is to make loads and loads of money because it is what that runs the world. Unlike the past, we now live in a goal-oriented world, where we are supposed to be a winner to enjoy all the material things in the world from luxurious cars, jets to sprawling living spaces. For some success happens even without their knowledge and for some it happens only after many hardships and failures. There are also some who in spite of putting all their efforts, money and time do not taste the fruit of success and may even go through various difficulties like loss of concentration in business, mobilization of money, finding the right business venture to invest in and so on. Jeevanacharya offers solutions only after studying each and every case thoroughly so that he reaches the root of the problem. His institution and expertise in the fields of astrology, yoga, Veda, five boodhs and the likes have made him quite popular among the business community. His association has made many feel energized, goal and action oriented, aware of the self and its abilities, creative, socially responsible, alert to opportunities and most important of all imbibed positive thinking and attitude towards life. This has enabled them to do business without any fear, guilt or hatred. The society we live in today is proliferated with greed, frustration, selfishness, jealousy, ego or vendetta that it might turn a successfully running business to end-up in loss or doom. Many would have felt at some point or the other that they are experiencing losses for unknown reasons, certain kind of negativity engulfing the business venture or premises, tenders or contracts going into the hands of rivals and people of hatred spinning ill-stories around to bring down reputation and in turn disrupting business deals. Some of these might be due to known facts while some due to unknown facts. The same way the factors contributing to business problems could be within the person doing the business itself or depending on whom he is collaborating with. Whatever might be reason or situation the root cause of the problem always points to the disturbances in the cosmic energies, planetary positions and even ‘karma’ or past life experiences and deeds. Earth is a big magnet that revolves around the sun and has pronouncing magnetic and gravitational force which in turn has notable effects on anything and everything on it, both non-living and living. Being the only natural element that is associated with all the five human senses including touch, smell, sight, sound and taste, it exerts optimum influence on humans. Capricorn, Virgo and Taurus are the signs that belong to this element. Those who are born with the influence of this element tend to be very practical, methodical in approach, adjustable in nature and firm in their decisions. We can find such people most often in administration, civil services, property, building, agriculture, mining and food related fields. When this element is in the balanced state, the person would be prudent and tact while they would be proud and obstinate when it is in excess quantities. The body parts that bear the brunt of this element are intestines, knees and throat. This vital element is very important for almost all living organisms on earth for their survival and is represented by river, sea, rain, steam, ice and so on. Since this element is volatile, individuals born under the influence of ‘water’ element possess wide-ranging emotions and so are found to be sociable, fond of material things, creative, flexible, fanciful and have a penchant for novelty. In a way it denotes laziness, inoffensive attitude, carelessness, slowness and harmlessness. Zodiac signs falling under this catergory are Pisces, Scorpio and Cancer and deal with all kinds of liquids to become wine merchants, sailors, marine engineers, dealing with petroleum, chemical and the likes. When there is an imbalance of this element, they are prone to damp feet, cough and piles. All life forms including animals, plants and humans depend on this element for Prana-vayu or Oxygen for their survival. A person born under the influence of this element either belongs to Aquarius, Gemini or Libra. These people are found to be amiable, neat, gentle, cheerful and courteous person. Since Airy Zodiac signs denote intellect and intuition, these persons make good lawyers, advisors, astrologers, philanthropists, accountants, writers, scientists and management consultants. If this element is disturbed in the body it could affect the kidneys and lungs and can be the cause of blood disorders. This element is closely associated with the sun, the vital energy source which is also considered as the universe’s soul. Apart from this “Fire” element is associated with the lighting, seasons, volcanic radiation and various other aspects related to the solar system as well. Sagittarius, Aries and Leo are the Zodiac signs classified under the fire element denoting energy and vitality. This is why persons born under the influence of this element have a flair for power, fast, highly intelligent, sharp and curt in behaviour. No wonder they become successful surgeons, engineers, union leaders, social activists and politicians. Out of the five elements sky is the only element that is universal to all zodiac signs. It is said to be the unending region that comprises of our solar system and other galaxies unknown to mankind. Hence is also considered as the mystic element. We all know that Vedic astrology also referred to as divine science has always remained a subject of interest all over the globe for its ability to interpret the alleged mysterious influence of planets/stars on affairs related to humans. 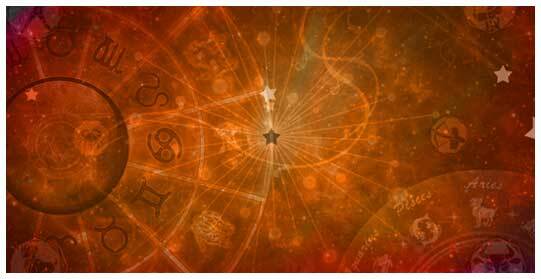 If approached properly by an expert, astrology can even enable one to get a sneak peep into the puzzling future. 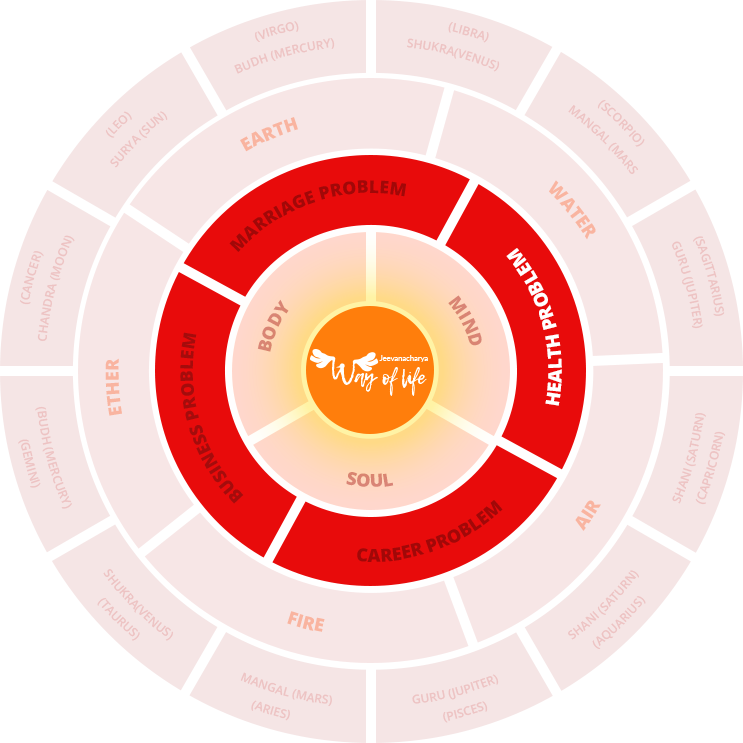 Though it branches out as palmistry, horoscope reading, prasna, annual chart, transit and so on, Zodiac signs have proved to be the simplest yet effective ways of interpreting a person’s life. It is like a map of the planetary positions and their influences on humans with its roots pointing towards their karma. Since humans are governed by the planetary positions during their time of birth, their weaknesses can lead to problems in humans that could be of physical, material, psychological or even spiritual nature. Zodiac signs are 12 in number; each and every sign is distinctive in its own way having specific desires, traits, strengths, weaknesses and attitude towards people and life. If studied intently we can find out that each of the 12 zodiac signs belongs to any one of the four elements viz., Fire, Air, Water and Earth that dominates our persona and actions. Only when we precisely know which zodiac sign we belong to, we would be able to focus the energies of the above mentioned four major natural elements to understand our potential, traits and positive side in order to tackle the negative aspects. Fortunately, Jeevanacharya is present amidst us and can guide us to overcome the physical diseases, mental afflictions, professional setbacks, personal relationship problems, addictions, loss in business and so on caused by the planetary positions through his insightful solutions. Fire element dominated zodiac signs are Sagittarius, Aries and Leo. Persons born under the influence of this element tend to be dynamic, temperamental and passionate. Though they flare up quickly, they also pardon easily. Most of them have a strong physique, brim with energy and will have an inspiring personality. They are also creative, intelligent, idealistic and ever-ready for action. No wonder they involve themselves in adventure sports and hold high ranks in military related fields. Water element dominated zodiac signs are Pisces, Scorpio and Cancer. Individuals born under the influence of these signs are said to be highly sensitive and exceptionally emotional in nature. These people are very shrewd, love intense conversations, long for intimacy and offer unconditional support to their near and dear ones whenever expected. They often behave like a mysterious ocean and seldom do anything explicitly. Air element dominated zodiac signs are Aquarius, Gemini and Libra. Air signs tend to be very friendly, communicative, intelligent and analytical. Humans born under the influence of these zodiac signs love to communicate, stay committed in relationships, think rationally and will have an active social life. We can often find them among good books, friends and discussions. Giving free advice is their forte but can also prefer to be superficial depending on whom they deal with. Earth element dominated zodiac signs are Capricorn, Taurus and Virgo. People born under the influence of these signs are often realistic, conservative and emotional. Though material comforts and possessions attract them, one can expect them to be stable, practical, loyal and by the side of their loved ones during their hardships and moments offering strong pillar like support.